From this month, February this Jetfoil goes to Izuoshima and Tateyama in Chiba Pref for 1 month. 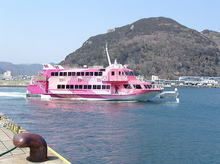 In this season "Tsubaki (Camellia) Festival in Izuoshima and Kawazu Sakura(Cherry blossom) Festival in Kawazu and Minami Izu are held, so this ship is operated from February 8th to March 14th. The first Jetfoil was build by The Boeing Company in 1975. This entry was posted in Travel on 2006年2月1日 by izusakuraya.